Well look at this wee little number I found on Esty. 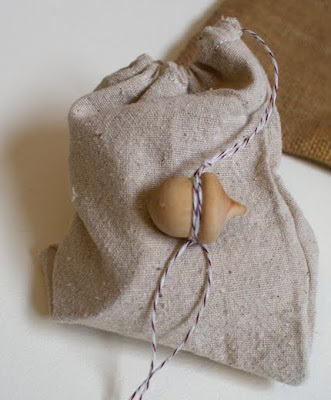 Wee Waldorf's says "my wish is to have more natural elements in the daily things my little girls use every day." And these are lovely. 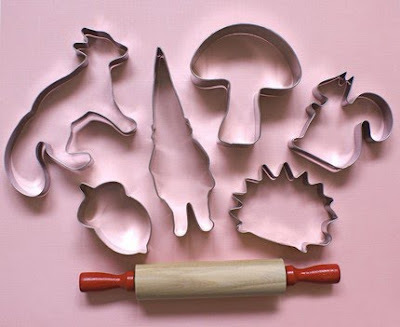 I'm a big fan of cookie cutters and these are very sweet. Contains 6 enchanted cookie cutters make up this fun set: Gnome, Squirrel, Fox, Hedgehog, Acorn and Mushroom. And it also comes with cute 7" rolling pin. Cookie cutter care: Hand wash in warm, soapy water. Dry thoroughly.USD $29.95 / €22. 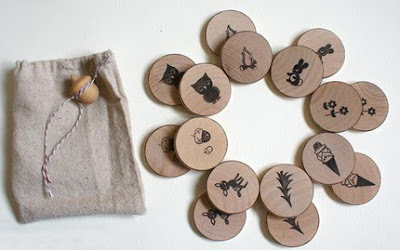 Wee Waldorf's second offering is this Sweet Matching game for little hands. 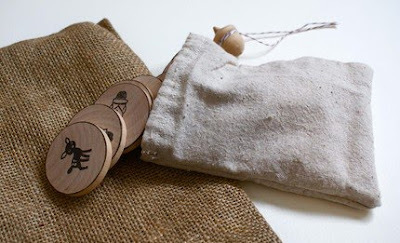 It consists of 16 hand-stamped forest friends wooden circles, and comes in a natural muslin storage pouch embellished with wooden acorn. Characters sets include: Gnome, Owl, Fawn, Bunny, Acorns, Flame, Flora, Pine. Each circle round measures a big 2" across for easy gripping. USD $23.25 / €16.95.